Season the chicken with salt and pepper. Heat olive oil in a 10-inch skillet over medium-high. Add chicken and cook on both sides until golden-brown, about 5-7 mins. Set aside chicken. Reduce heat to medium. Add oil, shallot, garlic, chipotle, and salt, cooking until fragrant, about 30 seconds. Add the broth and scrape up the browned bits; bring to a simmer. Stir in half of the Old Dutch Restaurante Style Chips. Position the chicken into the broth and cook until 165ºF, about 10-15 mins. Transfer chicken to a cutting board, let cool, and shred. ​Meanwhile, preheat the broiler and adjust oven rack to about 6 inches below the heat source. 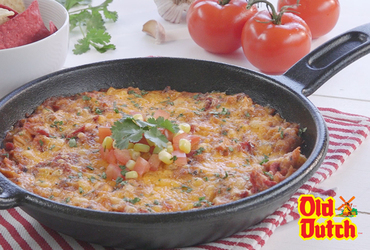 Return chopped chicken to the skillet along with corn, tomato, ½ cup cheese, and cilantro. Stir in the other half of the tortilla chips until they are incorporated and moistened. Remove pan from heat. Sprinkle remaining cheese on top, and broil until cheese is melted and browned, 2-3 minutes. Allow to cool and garnish with cilantro and chopped tomato; serve, and devour!